Postcard from Lagos: Bye-bye BRICs, Hello MINT Countries, Open Season for Open Letters, and The Trauma of Darkness. Bye-bye BRICs, Hello MINT Countries, Open Season for Open Letters, and The Trauma of Darkness. It’s the season of open letters in Nigeria. 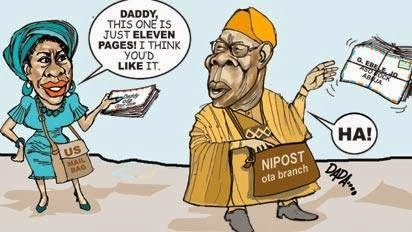 Triggered by former president Olusegun Obasanjo who, late last year, wrote an open letter to current president Goodluck Jonathan, it appears everyone have suddenly discovered their letter-writing gift. President Obasanjo’s letter was speedily followed by an unflattering response from his daughter, Iyabo who used to be a senator. Not to be outdone, Goodluck Jonathan responded to Obasanjo, you guessed it, through an open letter. Whilst Nigerians were digesting this letter-writing exercise, Edwin Clark, the current president’s kinsman brought in an ethnic dimension by lambasting Obasanjo via an open letter for daring to write to Goodluck Jonathan. It is not impossible that there may be other actors in this open letter saga that have escaped my radar. Of course, this being Nigeria, we are not exactly sure if all the letters were genuine. Ibrahim Babangida who ruled Nigeria between 1985 and 1993 came out a few days ago to denounce an open letter to the current president purportedly written by him. There is also a cloud over whether Iyabo Obasanjo was the author of the letter to her father. Although this whole affair is a diversion from the different woes we are facing at the moment, the exercise provide a comical, if not stress-relieving drama to the theatre that is Nigeria. Keep them coming please! It’s dark at night in Lagos these days. Much more than it used to be. No one really knows why, but the speculation is that the thermal station that serves Lagos is operating at half its capacity. This means electricity is rationed. If we are lucky we get two to four hours in a day, and none at all in many instances. What makes this different is the extended period of the problem and the fact that everyone everywhere in the city seems to be affected making it the subject of discussion on people’s lips. The consequence is that more than ever before, the sound of generators rends the air day and night. And when their owners are tired of burning cash just to catch a good night rest, the darkness returns, albeit with an eerie silence not dissimilar to what you will experience in a scary movie. What’s more; at this time of the year, it’s getting hotter too. So it’s a triple whammy trauma for most people at night – no electricity so no respite from the heat, mosquitoes have a field day feasting on those who sleep uncovered. And all of these happening in the dark. Given the daily trauma of the average Nigerian, I wonder how the President manages to sleep at night with his conscience intact. Forget the G8, the G20, or BRIC(S) countries, here comes the new kids on the block – the MINT countries comprising of Mexico, Indonesia, Nigeria and Turkey. These countries are tipped to become the next economic powerhouses with Nigeria predicted to rank 13th in world GDP by 2050. Analysts believe that the growing population of these countries, the plentiful supply of labour and their strategic geographical location will drive their economies faster than many other countries. What is not in doubt about Nigeria is the resilience of the people. The fact that there is any growth at all in Nigeria is incredible given our perilous power situation. Analysis reveals that 170 million people in Nigeria share about the same amount of power that is used by 1.5 million people in the UK. What this means is the potential for growth is limitless if we can improve power generation. I am happy about this type of news but I am also pragmatic enough to accept it for what it is - a prediction. I desperately wish it happens. I believe it can happen. However, I know enough that we have very little economic activities in Nigeria compared to the other MINT countries. I also know enough that we are a consumer nation whose citizens order plastic from China, hair from Peru and fabric from Turkey. In the last three weeks alone, two close friends have been to Turkey on fabric related tours.